One of the most complex tasks for sales leadership to navigate is assigning sales territories to sales reps. It involves an intricate array of figures and balancing, not unlike the tricky task of drawing boundaries for electoral districts (and both can involve contentious politics). The difficulty lies in distributing the territory to both maximize your results and ensure equity for everyone. 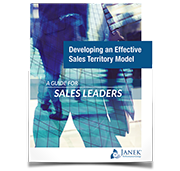 There’s a myriad of ways to divide the sales territory map, and creating a hierarchy of clients is often essential as part of best practices to ensure motivated, productive sales reps who will drive sales and revenue. Specifically, this paper looks at methods of division, fair territory distribution, mapping software, client and prospect prioritizing, sales territory ranking, and suggests a promotion system for sales territory as a possible option.